Jon Athan: "In the Name of the Devil" is available now! "In the Name of the Devil" is available now! A single father, Jamie, is rattled when his son, Casey, begins to show signs of aggression. When Casey's extreme aggression and bizarre behavior challenge the realm of human explanation, Jamie questions and tackles every horrifying possibility. A severe mental illness? A spiritual ailment? A demonic attack? A father on the edge, Jamie enlists doctors, a parapsychologist, and a priest to aid him in his search for the truth. Can he save his son? Or will evil prevail? 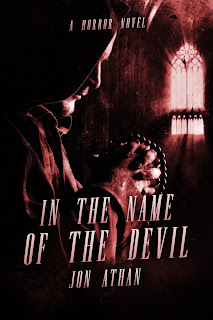 In the Name of the Devil: A Horror Novel is available today! You can purchase your Kindle copy for $2.99; if you're a Kindle Unlimited subscriber, you can also read the book for free. Regardless, thank you for your support. Your readership is invaluable. Stay tuned for more writing updates! "Mr. Snuff" is now available for pre-order! Writing Updates for March 2016! March 2016: Free Books of the Month!